With our latest release (version 1.0.298 see download page) one of the main new features is the ability to import backups. 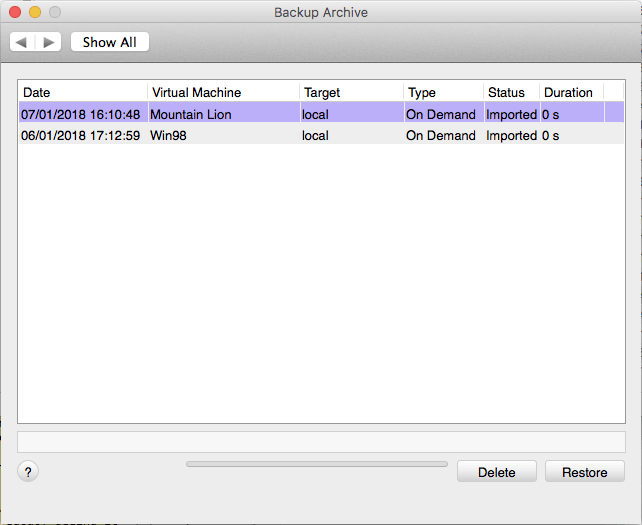 Normally Vimalin keeps track of all your backups in a database and based on the data in there it will show you an overview of all the backups you currently have. Those backups can be on different disks and/or network locations. That works great. But what now if you happen to do a fresh install of macOS and you don’t have that old database available? Then Vimalin would not be able to locate those previously made backups. Until now. Another scenario is if you have multiple machines that you backup via Vimalin. Normally you only see your own backups. Vimalin stores the backups per host, and the database is stored locally so normally you do not see backups from other hosts. If you want to put back a backup from another host then there was no easy way to do that. This new feature also makes this much easier. If you select “Yes” then it will scan the contents of the Disk target and report back what if found. As you can see in our example it found 2 backups of 2 VMs. The first one is a backup that was made onDemand earlier today while the other one is a backup of Win98 made yesterday. Note that it will only add backups not already in your database and that it will verify if all the files that make up the database are available. You can even remove the target and add it back to sync with the disk target.